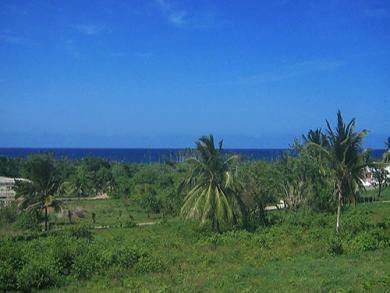 A stunning piece of land located midway between the towns of Sosua and Cabarete. The land offers an unobstructed view of the ocean at a comfortable distance. The perfect location to built a high-end condo residence, hotel or subdivide into lots ideal for luxury ocean view villas. Probably the best ocean view site in the area. The property slopes, 10 meters in elevation from back to front facilitating an ocean view from every level of construction. The property is surrounded with green/park areas: these areas have been designated as "green area" and located directly in front of the property, adjoining the property at the upper side and across the road at the top. Readily accessible electricity and water. Walking distance to the very well know Encuentro beach. Now listed at a very reduced price ! !